Events of 23rd November in Birmingham saw 25 churches and networks come together to pray and be inspired to think about mission opportunities of 2012 and beyond. 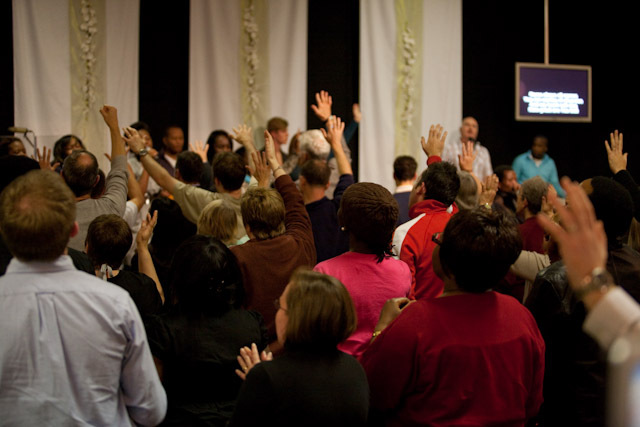 400 city-wide Christians joined in the celebration to commit together in prayer and unity. The whole congregation knelt and brought friends before God after an inspiring challenge to share Jesus with others, by Mike Pilavachi. Roy Crowne challenged the churches to work for the big mission moments of the Big Lunch, the Olympics and harvest next year. The Bishop of Birmingham Rev David Urquhart pledged that he and the Cathedral would be right behind HOPE. Mark Ryan of Birmingham Christian Centre said: “Birmingham churches are moving out of a time period when they have not really connected well together. Now HOPE are inspiring us to create fresh connections of relationship and vital expressions of working together. Thanks to HOPE for coming and bringing this clarity and insight to us as the united churches of Birmingham." ‘Imagine’ at St Thomas’ church in Lancaster on 3rd November was an inspiring event from the offset. The leaders’ lunch gave a chance for 135 leaders from across the North West to meet together and share vision and encouragement. 350 people from across the region attended in the evening with many responding significantly to the message. One of the Lancaster ministers has carried a stake for 12 years, it was given to him with a prophetic picture of pioneers in America claiming land. He wanted to use this in the context of praying for the city alongside other local Churches. Feeling the time was right, 30 people on the 4th November representing four churches, travelled with him to the highest point in the area where they repented, prayed and committed again to the city. Churches there already present a portfolio of services/activity at meetings with the council, under the banner of HOPE.